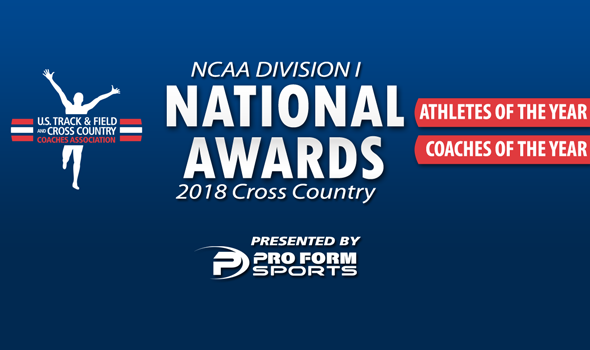 NEW ORLEANS – National Athletes and Coaches of the Year for the 2018 NCAA Division I Cross Country season were announced Tuesday by the U.S. Track & Field and Cross Country Coaches Association (USTFCCCA), following the national championship meet this past weekend in Madison, Wisconsin. Morgan McDonald of Wisconsin and Dani Jones of Colorado were named the Men’s and Women’s National Athletes of the Year, respectively, following their individual victories at the Thomas Zimmer Championship Cross Country Course. Michael Smith of Northern Arizona and Mark Wetmore of Colorado were named the Men’s and Women’s National Coaches of the Year, respectively, after leading their respective teams to national titles. Morgan McDonald took a redshirt last cross country season in order to preserve eligibility for 2018, when the NCAA meet would be held on Wisconsin’s home course. He wanted to go out a champion in front of his home crowd. McDonald broke away from a strong pack in the final sprint and crossed the finish line in 29:08.3, five-tenths of a second ahead of Stanford’s Grant Fisher. The senior from Sydney, Australia, never lost contact throughout the race and bided time until he made his winning move. That was the third win of the season for McDonald, who only raced four times. He also broke the tape at the Nuttycombe Wisconsin Invitational and at the Big Ten Championships. McDonald is the first Wisconsin athlete to be named Men’s National Athlete of the Year since Simon Bairu went back to back in 2004 and 2005. Adverse conditions didn’t bother Dani Jones: She thrives in them. This past weekend, with two inches of snow covering the 6K tract of the Thomas Zimmer Championship Cross Country Course, Jones became the first Colorado woman to win an NCAA XC title since Kara Grgas-Wheeler, when she broke the tape in 19:42.8, nearly three full seconds ahead of New Mexico’s Weini Kelati. Jones’ individual title also helped propel the Buffs to their first national title since 2004. That was the second win of the season for Jones. The senior from Phoenix, Arizona, also won the individual title at the Pac-12 Championships on October 26, which was her second conference title in a row. Jones is the first Colorado athlete to be named Women’s National Athlete of the Year during the cross country season dating back to at least 2004. Northern Arizona did it again. The Lumberjacks, under Michael Smith’s direction, won their third consecutive national title this past weekend. NAU became the first NCAA DI men’s program to do so since Arkansas accomplished the feat from 1998 to 2000. Smith’s Lumberjacks were ranked No. 1 in the National Coaches’ Poll throughout the season and went undefeated in 2018. NAU also won meet titles at the Nuttycombe Wisconsin Invitational, at the Wisconsin Pre-Nationals, at the Big Sky Conference Championships and at the Mountain Region Championships. This is the second year in a row that Smith won the Bill Dellinger Award. He joins Mark Wetmore (2013-14), Dave Smith (2009-10), Vin Lananna (2007-08, 1996-97) and John McDonnell (1998-2000) as the only coaches to have won this award in back-to-back years. Colorado waited 14 long years to top the podium at the NCAA DI Cross Country Championships. So you better believe the Buffs savored every moment of it after they dominated a talented field this past weekend en route to their first national title since 2004. Colorado’s women, under Mark Wetmore’s direction, posted the third lowest score since the race changed from 5K to 6K in 2001. The Buffs totaled 65 points and put three runners in the top-15, led by Dani Jones’ individual title. Wetmore’s team also won a title at the Nuttycombe Wisconsin Invitational, after which they took over the No. 1 spot in the National Coaches’ Poll for two weeks. This is the third time in his illustrious career that Wetmore won the Peter Tegen Award. He also received it following the 2000 and 2004 seasons, when his women also won national titles.